She's Fantastic: WWE Wrestling - NIA JAX! WWE Wrestling - NIA JAX! There comes a point in action figure collecting when you feel like you've seen everything. Every type of person, every type of alien, every color hair, every oversized weapon imaginable. But then it hits you like a ton of bricks when you see a plus-size female action figure hanging in the aisle and it stops you dead in your tracks. It's amazing to me that there hasn't been more body diversity in this hobby. Considering the real-world diversity of body types we see every day, the only bucks we see range from adolescent to muscular, but nothing beyond that. Sure I understand that most male figures are idealized Supermen as well, but not all. Without hesitation from the toy companies we get every male from Tyrion Lannister to Andre the Giant. There was an Amanda Waller JLU figure years ago. But that is literally the only female figure I can think of who broke the body mold before this Nia Jax hit the shelves. It's about time. Now we just need an MLF Thumbelina! Anyone? Just me? Fine. Let's check out Nia Jax! SIDE NOTE: I'm restarting the social media arm of this blog (after years of being lazy). I made a new Instagram account (shesfantasticmadeofplastic) where I'll be posting pics of purchases, exciting press photos, toy events, and store finds. And I'll try to post links to new blog reviews on my Facebook. Click the links on the Right. Thanks! 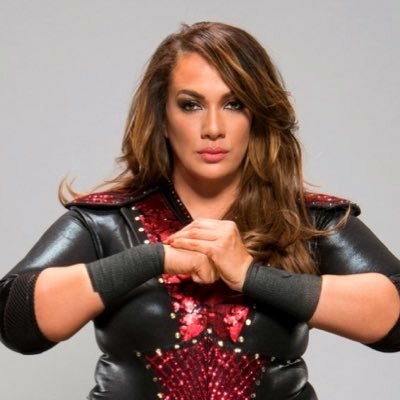 Nia Jax is a former plus-size model, cousin of the Rock, and now an NXT Wrestler (who will be appearing in Total Divas Season 7 next month). I'm super glad they made her into an action figure and that they didn't shoehorn her into an existing sculpt. That said, this figure does her no justice. She wasn't a former model for no reason. She is a very attractive woman with a very strong physique, and this figure (the face at least) doesn't portray that very well. Here is Nia with two recent WWE figures that really show off the different scales: Asuka and Tamina.